Daphne Guinness, you are my hero. Not only are you an eccentric heiress, jet setting from one soirée to the next, and being a muse to many of late (more to come on that – can’t seem to keep up with all the Daphne G sightings lately), but you really do live the couture life. The goth part of my soul cried a little when I saw your latest ensemble for the Maybach party. Maybach (pronounced mai-bakhh) is the ultimate luxury car line from Mercedes-Benz, coming in at $250K, for those of us who are non-heiress/eccentric/jetsetter types, and may not have heard of it. André Balazs and Daphne Guinness attend the Maybach presents David LaChapelle’s “Bliss Amongst Chaos” party at the Raleigh Hotel in Miami. Daphne wore couture (anyone know whose? ), perched atop Nina Ricci heel-less platforms, and was dripping (later, literally) with diamonds. Yes, those are diamonds NOT crystals. I am guessing this is the bespoke piece Shaun Leane was working on for a “special client”? You know, just hanging with my boyfriend, wearing couture and a diamond, floor-length spider web and heel-less wonders by Olivier. De rigueur. Her hair is all black now – taking over from the few black streaks that were a trademark in her platinum blonde mane. And you know those couture shows where the model’s face is covered in fabric or mesh and you think: who wears that? Her face was covered in fishnet – with a scarlet lip, too. Wonder how that didn’t feather? The Saturday night impromptu pool party was part of a series of events for Art Basel Miami, and capped off the day’s earlier, likely more poised presser and dinner for Maybach. I say impromptu because the only ones diving into the pool were part of the performance – David LaChapelle in his underwear, synchronized swimmers and yes, Daphne G in all her diamonds and couture. Just when you thought it couldn’t possibly get any more decadent. 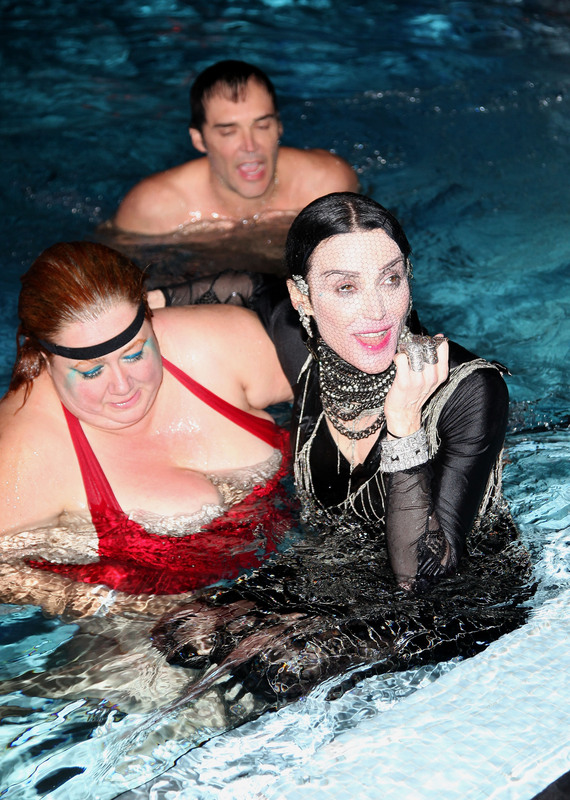 Make-up artist/model Sharon Gault, photographer David LaChapelle and Daphne Guinness swim in the pool during the Maybach presents David LaChapelle’s “Bliss Amongst Chaos” party. Oh what a tangled web we weave. Guests likely dived in afterwards, fishing for diamonds! Talk about putting a sparkle in your step! The whole thing was to celebrate Ms. G’s collaboration with LaChapelle on the ad campaign for the can’t-afford cars. LaChapelle is a photographer extraordinaire and former fast lifer (now he lives amongst the trees in Hawaii). No simple life for Ms. G. She’ll continue living my couture dreams, it seems. All photos by Alexander Tamargo/Getty Images for Maybach. Previous Post Bloggers in Vogue?